An article by Aditya Chakrabortty yesterday is not what you or I would call journalism. It's clickbait, because that's the only way for the legacy media to get noticed these days. Chakrabortty says in his Twitter bio "I am gainfully employed by a newspaper. Future generations will not be able to say that". I rather expect the reason for that is because we are fed up with the likes of him. Now I don't normally go in for the fisking technique on this blog because I've long since vowed not to let the legacy media set the agenda - but with Brexit now being so brain-wiltingly tedious I am for once going to take the bait. Let's dive in! Cut the niceties. Skip the jargon. Let us speak the plain truth, however ugly. What is driving this country headlong into a chaotic and punishing Brexit is a blind desire to cut immigration. That’s why people voted to leave the EU, politicians and pundits tell us. No data supports that. It is primarily remainers who bleat that narrative because it's easier to salve their own conscience if they believe the reason really was that we are all a xenophobic horde. That’s what makes a Norway-style deal impossible, since it would almost certainly allow freedom of movement with mainland Europe – and any prime minister accepting that would be strung up by the press for treachery. Well, as readers of this blog are well aware, there are a number of obstacles to the Norway option, largely to do with the issue of regulatory sovereignty and to a point freedom of movement. These are largely myths created by the remain campaign which have since been adopted by the Brexit ultras. EEA freedom of movement for workers is a wholly different animal to EU citizenship and it can be amended. Those details, however, will not feature on the limited horizons of Chakrabortty. Cutting to the chase, Chakrabortty picks up on a study showing the media incontinence on the subject of immigration. So you can see what's happening here. Chakrabortty is building the narrative that Brexit is xenophobia, the plebs were conned by the media and nothing that they believe is actually true because the experts says so. The subtext being that we are knackering our economy for no good reason and it's all in our imagination. What symptoms there are is entirely the fault of austerity and nothing at all to do with surges of hapless bipeds turning up looking for work. As is typical Chakrabortty invokes the village McExperts, in this case Jonathon Portes - the man who is in part responsible for much of the mythology surrounding the EEA option. The whole case presented depends on the destruction of a a straw man. To say that the classic media narrative in respect of immigration is incorrect or overblown is actually plucking at the low hanging fruit. It's very easy to shoot down those arguments. The problem, though, is that it does not bridge the disconnect between well argued reason and what we see on the streets. Illustrating this well is Ben Judah writing in that well known ultra-far right magazine, the New Statesman where he describes his experiences masquerading as a migrant. What Judah reveals is a black market economy based on exploitation. We are told "Study after study has failed to find any evidence of significant undercutting of wages" - which begs the question, where are they looking? Ben Judah can find it. Why can't Kings College? You only need go to a busy NHS hospital to see that the kitchen and cleaning staff are mostly migrants working in minimum wage or lower when you scratch away the creative accounting. Migrant workers with low overheads living in squats, over-crowded HMOs and beds-in-sheds can easily undercut - but because this is off the books it doesn't count in the official statistics. To say that it does not create wage pressures for the bottom decile is a flat out lie. But underlying this is the further narrative that the NHS depends on immigration. What they actually mean is that the NHS depends on exploitation. But then this isn't just about wage pressures. Speaking more broadly the argument is that immigration creates growth. This is the typical narrative of the spreadsheet sociopath in hock to the cult of GDP who sees economic growth, irrespective of inequality, as the be all and end all in life. The fact of the matter is that people don't want their towns and public spaces turned into migrant transit camps. They don't want aliens on the streets fighting their turf wars - and when GDP growth does not translate into prosperity for many, why on earth should they put up with it? Of course there are measures we could have taken, not least deporting those who were sleeping rough and had no employment, but a court has ruled that as discriminatory. The government said it was disappointed by the ruling - which applies to people from the EU and European Economic Area - but would not be appealing. We just roll over and accept it. Then there's the effect in the regions. This local news story is absolutely central to the immigration debate. "A war of words has broken out between the police, fire service and landlords over claims that parts of Rhyl have been turned into a crime-ridden “ghetto” because of a glut of rented properties". The spat erupted after an officer said poor management of multiple-occupancy housing (HMOs) was a factor in how many incidents police were being called to in west Rhyl. Houses of Multiple Occupation (HMO) are supposed to be inspected and licensed and managed by councils. They don't do it. Consequently, even if gang labourers were paid minimum wage (yea right), local workers still cannot compete because immigrants can massively undercut on expenses by way of overcrowding HMOs. The Landlords Association confirms "Councils are dreadful at prosecuting rogue landlords. The prosecution rate in 2012 was less than 500 out of 1.5m landlords. "Councils often won't do anything about it because if they evict they have a statutory obligation to house them, adding to an already acute problem. The overcrowding and consequent crime it brings is what generates a great deal of resentment. Notionally migrant workers are not entitled to be rehoused but there are enough rulings in the system whereby anyone who can classify themselves as vulnerable can evade deportation. This is where Chakrabortty, Portes et al would argue that austerity is responsible. Councils could do more were they not "cut to the bone". Except that many of these acute problems are legacy issues that have been happening since EU expansion - back when councils had more money than they knew what to usefully do with. All of these social issues have an impact on the local level, often disruptive and it happened without any consultation or consent. And that is chiefly what is at the heart of Brexit. A ruling class that continues to do as it pleases and one that writes of any objection as racism and xenophobia. Jonathan Portes especially is a guilty of this and Chakrabortty is essentially weaving the same narrative. But let's say that none of these well documented issues are not true and that the New Statesman has fabricated what many working class people experience every day, there is still the issue of the "left behind". We are told by Jonathan Portes that EU workers are “ordinary, productive, middle income, middle-skilled – the sort of people our economy actually needs”. In some sectors I wouldn't dispute that. I've worked in plenty of places in the nuclear and aerospace sectors who will hire anyone with the right skillset - and will cast the net wide to recruit them. And that is another part of the problem. We have a recruitment sector that hires on the basis of tickboxes and companies not willing to invest in training. Labour has become a commodity - and unless you can afford the training privately then you're on your own. In this, I suppose I am to an extent agreeing with Chakrabortty, in that there are policy measures we could take that would mitigate the externalities, but the fact is, so long as we have an open door policy with the EU and elsewhere there is no economic or political imperative for our politicians to act, not least when the popular "experts" are deniers like Jonathan Portes. Patience has run out and the public have been insulted for the final time. Furthmore, Chakrabortty adds to that insult in saying "The Tories haven’t created this climate alone, of course. From Tony Blair to Ed Miliband, Labour leaders have marched alongside, muttering about “legitimate concerns” and handing out anti-immigration mugs. Forget about the evidence or leadership or having a backbone. Never mind the surveys showing that however much people dislike immigration in the abstract, they appreciate migrants". The anti-immigration mugs are in a similar vein to the Windrush scandal where we see an out of touch political establishment which does not understand the working class sentiment - and is blundering around to demonstrate that they do understand the issues. Because London politics is informed by the metro-hacks of the London bubble, like Chakrabortty, who think we are all foaming xenophobes, they make policy to placate on that basis. Chakrabortty evidently does not think there are "legitimate concerns" and all of the sentiment is whipped up by the tabloids - when in fact it is his ignorance and his misrepresentation of the working class which is primarily responsible for he knee-jerk policy making. Moreover, if you really understand Brexit, then you understand it is not a rejection of immigrants or immigration. A lot of us never expected to win the referendum but the preening obnoxiousness of the metro-establishment was a gift that kept on giving. 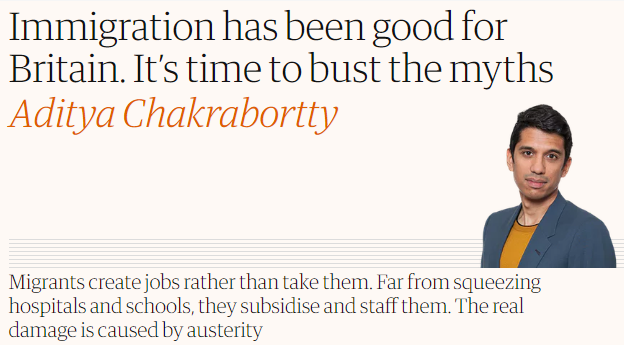 Chakrabortty is symptomatic of that very culture, where we tune in to the Guardian and BBC Question Time to see a yet another limp-wristed beta specimen with a speech impediment telling us we're thick racists taken in by the headlines we see in garage forecourts. I don't resent immigrants. One of the most important and inspiring people in my life is a Polish lady who made a life for herself from nothing and she has achieved more in ten years than I will in a life time. We all know a success story and we all recognise the contribution they make. But then at the same time we have a government who keeps using immigration as a sticking plaster instead of making fundamental reforms to pensions, schools and the NHS. Immigration is used as a means to extend the life of the post-war socialist settlement when the current model simply cannot sustain it. Being that the Guardian and the wider establishment will squeal at the very idea of market driven reforms, we are locked into continually absorbing more people, irrespective of whether people want their country to be transformed, communities disrupted and their identity diluted. Voters have drawn a line in the sand. If there is one consistent feeling among Brexiters it is that we want the trade and economic cooperation, and if the four freedoms were not said to be indivisible then more Brexiters would be amenable to the EEA option - but the establishment, by misrepresenting the issues out of ignorance have made it a binary choice. You can have trade or immigration control, but not both. The public will not stand to be blackmailed like this, and the EU's system wide refusal to accept that all of Europe wants more control over who and what crosses the border is a stark reminder that it simply isn't a democracy - and that is the primary reason for leaving.